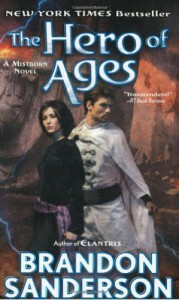 This is a combined review of the three books in the Mistborn trilogy. I read the first book in the series, The Final Empire, in 2008 – a little over five years ago – and remember liking it enough (I gave it 3 stars) to put the next two on my To-Read shelf. But it should be obvious that I wasn’t overly impressed with it. Of the many Sanderson titles available at the time, I was drawn to this one from the premise – What would follow if the Chosen One failed and the bad guy won? In the case of Mistborn it’s the thousand-year reign of the Lord Ruler. Book one is the story of the rebellion that brings down the Lord Ruler’s regime, and introduces us to the series’ main characters – Vin, a cruelly abused street urchin who can burn all the metals of Allomancy, and Elend, son of an abusive noble father and an idealist who dreams of building a better, more egalitarian society. Book two, The Well of Ascension, recounts the quest to discover the location of the titular Well so that Vin can assume its power and bring an end to the Ashfall and the Mists that continue to plague the land. It’s also about Elend’s struggle to create a viable society and government in the wake of the empire’s collapse. The Hero of Ages has Vin and Elend dealing with the unexpectedly dire consequences of finding the Well in book two. Now the kind of writing I am attacking, the Poughkeepsie style of fantasy, is also written in a plain and apparently direct prose. Does that make it equal to Tolkien’s? Alas, no. It is a fake plainness. It is not really simple, but flat. It is not really clear, but inexact. Its directness is specious. Its sensory cues – extremely important in imaginative writing – are vague and generalized; the rocks, the wind, the trees are not there, are not felt; the scenery is cardboard, or plastic. The tone as a whole is profoundly inappropriate to the subject….